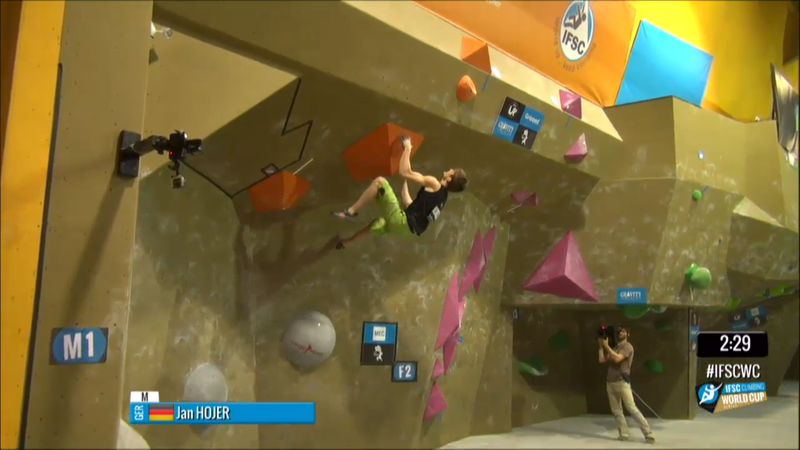 Julija in her first World Cup Bouldering final. She is 16. Julija got bonus but couldn’t get past it. Last go as time ran out she gave a great try but still fell off moving off the bonus. 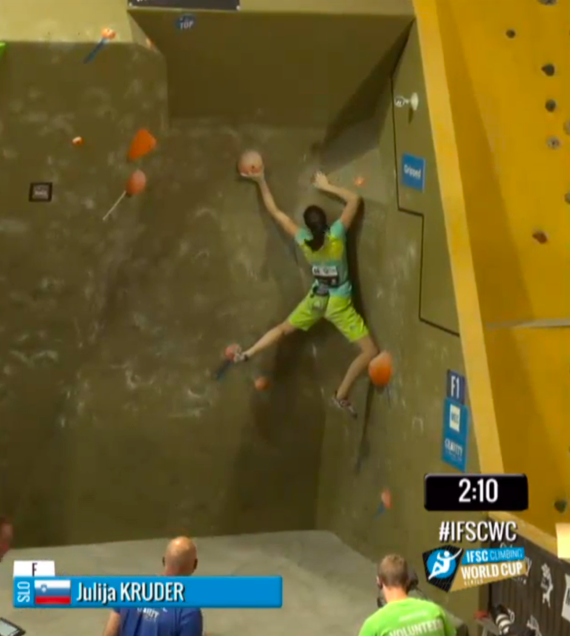 Right after the first climbers stopped there was a pause due to a clock issue that gave Julija an extra try past the last try she should have had. Luckily she didn’t get any higher than before so it shouldn’t affect scoring at all. Alex fell before bonus 1st try. Next go she got up in the corner and made bonus, then easily moved through the next moves and powered through to the last hold, which she did a pull-up on. 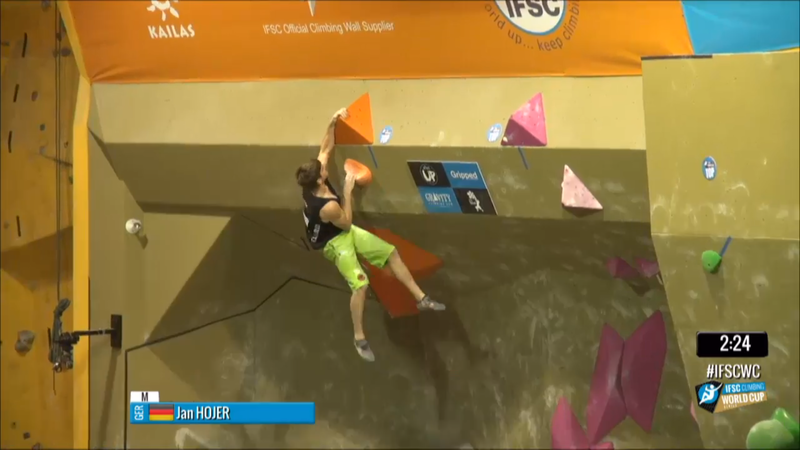 Jule moved slowly with good tension and got bonus first try, heel-hooked right, powered through to the end. Flash. Miho, who is wearing a Spongebob chalkbag. She hiked F1. Shauna flashed to bonus, seemed a bit uncomfortable but got a foot through, looks very powerful, cranks to the top right hand. Flash. 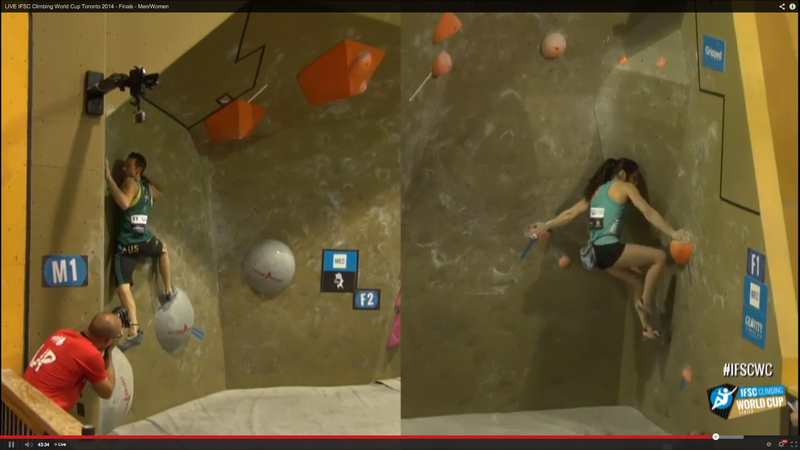 Alex at the bottom of Women’s 1. On this go she tried right foot high and fell. Next go she went left foot up first and continued. 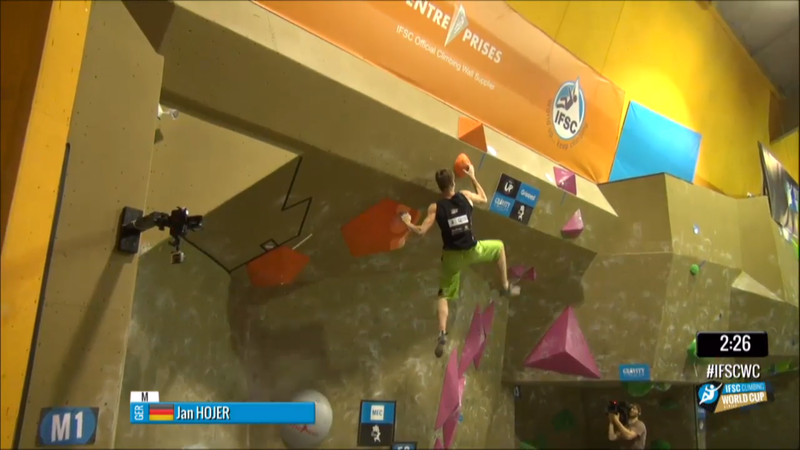 On the left, James is in the corner at the bottom of Men’s 1. From here he has to jump right to double press up on that orange volume bonus hold. James Kassay sizing up the dyno. Mondet fell off the jump several times, then as time ran out he stuck it and scored bonus. 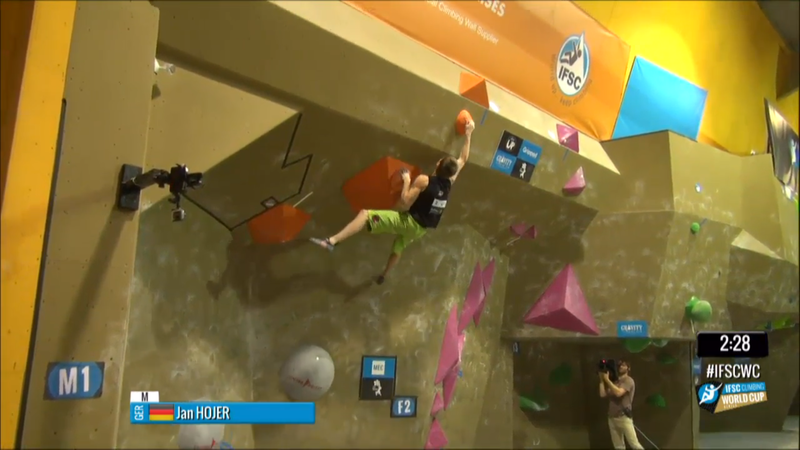 He rested a bit, then jumped for the double hand dyno and missed. Done. 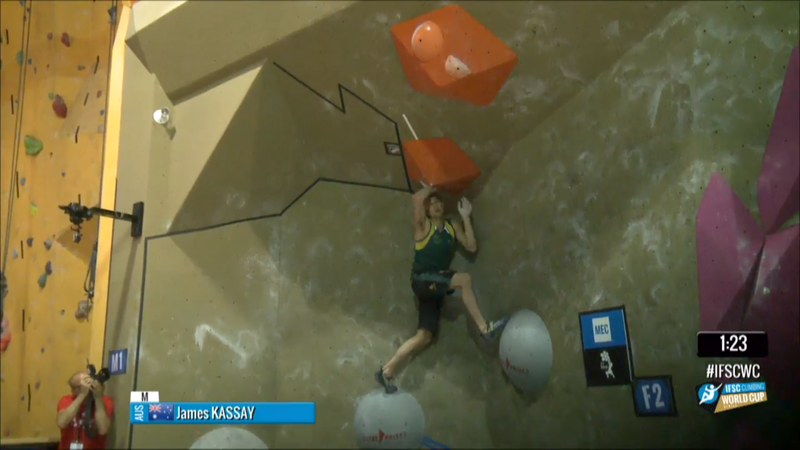 James Kassey did the jump first try but then slipped off. Second go he stayed on a bit longer, then slipped. Next go he got a hold of both catch holds but not well enough to stay on. The catch is a compress of two holds, and as the announcers are saying, it’s a blind jump and you can’t jump too hard. James fell there again. Next go slipped on the first jump. Got on as time ran out. Did the first jump again, tried to rest for a sec, jumped, hit both, didn’t stick ’em. Good tries. Rustam stood up slowly facing out, jumped and nearly stuck but his foot slipped. Fell on the jump again. Again. Again. Again. 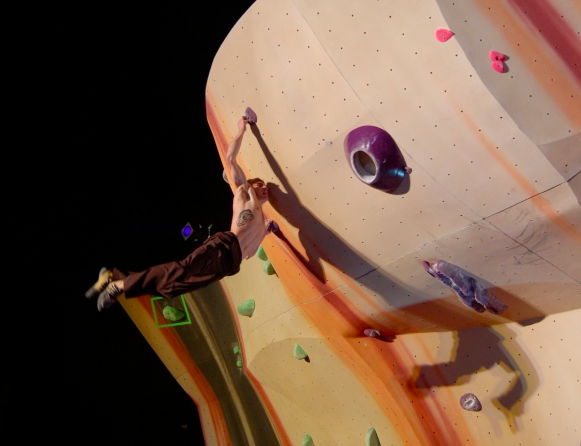 Seems like he’s trying to hang off the catch hold, when the other two pressed into it as it’s a slopey volume on an overhang with no visible holds on it. Fell again. Done. Jongwon Chon couldn’t figure out how to get off the ground and was actually called down first try because he didn’t touch the right volume with a hand and foot as he pulled off the ground. Next go he stood up and hit the jump but didn’t stick it. Fell again. Again. Again. So close to sticking but leaning out too far like Rustam did. Nearly stuck next go, just not quite getting up in the corner. Again. Last go he looked better on the hands but missed the right foot. No bonus. Done. 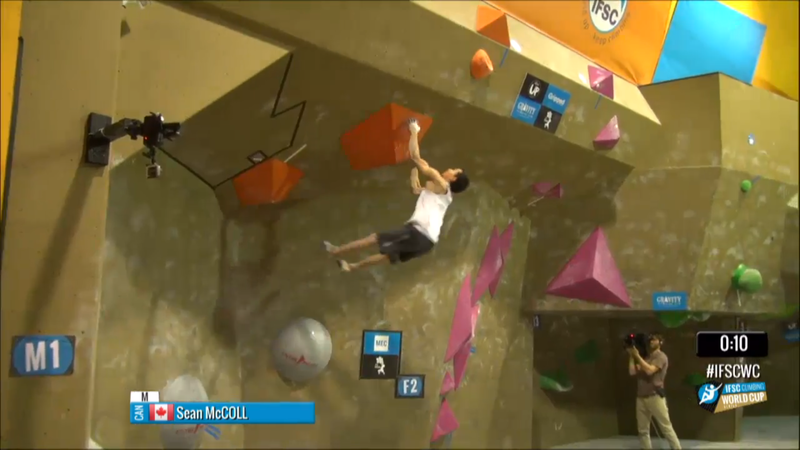 Sean flashed the first jump to bonus, then fell on the double dyno but looked close. Next go was the same, looked close but didn’t even slow down as he grabbed the holds. Nearly stuck next go, swinging out a ways before coming off, then had time to get off the ground for one last try. He does the first jump easily and catches with one hand as he presses into the corner. Hits the jump again and nearly sticks but comes off. Really good goes. Jan fell off trying to get off the ground. Turned around for next go, did jump easily, fell on dyno. Again next go. Next go he stuck it, congratulated himself as he slowly one arm campused his way to the top for the only send of the boulder. Sean so close to sticking the dyno. Then he just one-armed to the top.